Socrates, the most famous philosopher of all time, had one of the most subtle and complicated minds we have on record. His death was a dark moment in Athenian and human history, but his thinking and teachings have survived, a beacon of light for almost 2,500 years. Plato, Aristotle, Nietzsche, and many other great thinkers through the ages didn’t manage to give a definitive analysis of Socrates’ ideas, and we don’t offer to do it in this article. But here is an opportunity for those who would like an introduction to Socrates to get a generous taste of the life and thought of this illustrious man and renowned philosopher. Socrates was born in 470 BC and died in 399 BC in Athens. He came from a poor and humble family. His father was a sculptor and his mother a midwife. 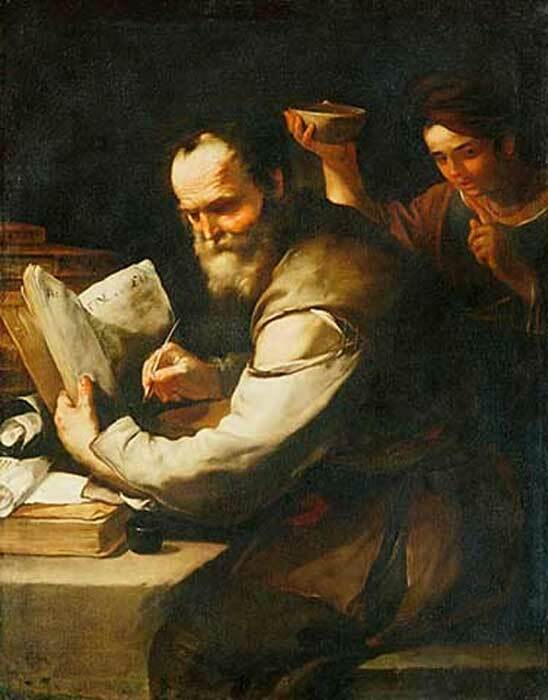 Socrates initially followed his father’s profession, as was common at that time, but eventually he quit, dedicating himself fully to philosophy. Information about the education of Socrates has not survived the ages, so we can only speculate. Some scholars have surmised that he may have been self-taught, basing his education on his own observations of the world and its people. Most of what we know of Socrates comes from the writing of Plato, who tells us that Socrates was an honest and decent man, and a citizen loyal to the laws of his state. He never failed to perform his religious and political duties such as voting, and he participated in the political life of ancient Athens, which he dearly loved. A lesser-known fact is that Socrates was also a soldier. He fought bravely in three campaigns of The Peloponnesian War, where he showed outstanding courage and selflessness, and remarkable endurance for the hardships he experienced during and after the battle. In the Symposium, a philosophical text by Plato , a young man named Alcibiades praises Socrates’ courage and his power to ignore cold and fear. 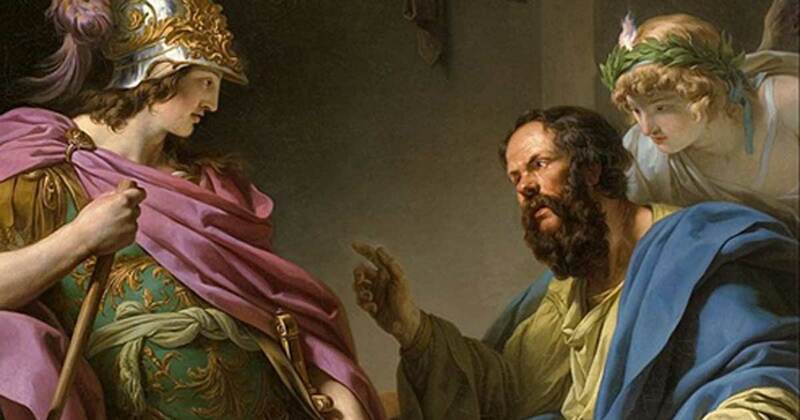 Alcibiades says Socrates saved his life in battle and then declined to be honored for it. In the Apology, which is Plato’s report of the speech Socrates made in his own defence, Socrates compares the act of retreating from philosophy to a soldier’s retreat from the enemy when it seems likely that he will be killed in battle. 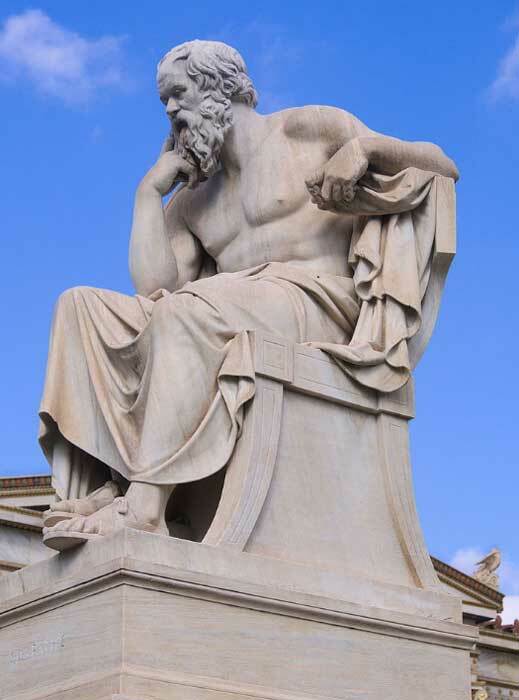 There was a legal case in Athens that is famous for illustrating Socrates’ moral qualities. After one naval battle, when violent waves and weather made it almost impossible to turn back, the victorious generals abandoned their dead (who went unburied and without the honors they deserved) and abandoned surviving sailors in foundering ships as well. Instead, the generals pursued the fleeing Spartan navy. Socrates was a member of the boule, the Athenian council of citizens. Determined to stand on principle rather than be swayed by popular opinion, in the face of threats of excommunication or death, he held out alone against a trial he considered unconstitutional. He blocked the vote until his turn as a member of the council came to an end, after which those of the generals who had not fled were condemned to death. After the end of The Peloponnesian War and the dissolution of democracy, Athens was governed by the Thirty Tyrants. Socrates was one of their hardest critics and often came in conflict with them, and especially with his one-time friend and former student Crito of Alopece. The Thirty Tyrants responded to people they considered a threat to their tyranny by confiscating property and condemning rebellious citizens to death. Socrates often collided with the Thirty Tyrants and refused to accept their authority, a position which played a key role in his being sentenced to death. Socrates is one of the world’s most enigmatic but most admired people. Just like Jesus, this great philosopher didn’t leave behind a single written word. All we know about his philosophical quests and teachings comes to us through other greats of that era – Aristotle, Xenophon, and of course Plato, whose accounts are considered the most credible and accurate of all. Socrates was a deep thinker and a dedicated lover of skepticism. His thoughts and questions focused mainly around the daily problems of human life. This is one of the principal ways that Socratic thinking is differentiated from that of the pre-Socratic philosophers, whose special field was natural philosophy. Pre-Socratic philosophers include such well-known thinkers as Zeno and Pythagoras. This philosophy rejected the myths that supposedly explained the world, and tried to find rational and mathematical explanations for natural phenomena, and sought to answer questions about nature with logic and reason. Socrates loved people. He loved to be in touch with them, to listen to them, and to hear their problems and ways of thinking. His teachings and speeches often revolved around the value of morality, bravery, kindness, loyalty to fair laws and to one’s country. He pointed out the negative effects of the opposites of these virtues. He taught young people, especially the offspring of the wealthy, not to over-value material things and not to care about gaining more riches, but instead to behave morally and to feed the spirit. He believed that people could solve problems and uncover the truth using logic as their only tool. Socrates may be best known for his teaching method called the “Socratic Method.” Socrates, in these deliberations, pretended to be entirely ignorant, completely unaware of the issues under discussion. But by asking question after question, he worked to elicit the truth from his conversational partner who, in the end, after answering all the questions, was brought to “the truth,” as Socrates called the conclusions of these dialogs. In Greek, the method is known as μαιευτική μέθοδος - the “maieutic” method, which refers to the notion that the truth is inside the mind and – just as a midwife (his mother’s profession) brings into the world a new baby – so Socrates brought out the truth from his debaters. For all his greatness and popular acclaim, Socrates had fanatic enemies as well, the result of his great powers of persuasion over the people and his influential opposition to the arbitrary authorities of his time. Unfortunately, this opposition led to his death. The famous trial of Socrates, which is considered one of the saddest cases of a miscarriage of justice in history, led to the imposition of the death penalty for the “Father of Western thinking”. In 399 BC, Socrates was accused of “failing to acknowledge the gods that the city acknowledges" and of "corrupting the Athenian youth.” Many historians believe that these charges were fabricated by misrepresenting questions that Socrates posed while teaching according to his Socratic method. The penalty dictated that he should voluntarily drink a poisonous brew made from hemlock. Even though Socrates could have saved his life by escaping from prison, he preferred to die just as he had lived – with dignity and courage, honoring the beliefs and values he had spent his life teaching. 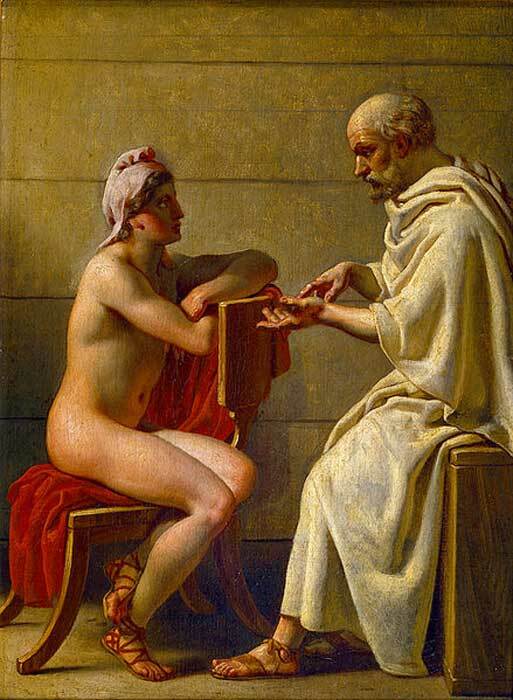 -Crito is the name of a dialogue between Socrates and Crito of Alopece about justice and injustice. This classic piece of literature contains an ancient statement of the “social contract” theory of government, timely even to this day. It is a source of inspiration after nearly 2,500 years. -The Dialogues of Plato are the most complete accounts of the teaching of Socrates to have survived from antiquity. -Socrates was married to Xanthippe, a significantly younger woman known for her fiery temper. They had three sons – Lamprocles, Sophroniscus and Menexenus. -Socrates is often described as unattractive and even ugly, and as a person who didn’t take much care of his appearance and clothing, and often walked around shoeless. -Socrates was accused of disrespecting the Gods, and some historians consider him one of the first well-known atheists in history. However, Socrates spoke about one superior power, leading some to believe that he was a monotheist. -Socrates didn’t accept money for his teachings and speeches, and was against the practice of the Sophists (teachers and scholars in ancient Greece) who offered their advice and knowledge for a fee. “Protagoras,” one of the most famous of the classic Dialogues of Plato, recounts the debate between Socrates and the Sophist Protagoras on this controversial topic. -When he was seventeen years old, Socrates met the philosopher Archelaus, and many believe this was the man who planted in Socrates a passion for philosophy. -In 2011, Socrates’ case was reopened in the Federal Court of New York. In this historic trial – attended by academics, everyday people, criminal lawyers, and Nobel laureates from all over the world – Socrates was acquitted 2,500 years after he was sentenced to death. After listening to history students making the case for and against Socrates, two of the three magistrates considered that the evidence was not sufficient to convict the great philosopher. -Socrates died at the age of 71. Theodoros Karasavvas has a Law Degree from the University of Athens and a Master’s Degree in Legal History from the University of Pisa. His interest in history has led him to research and write numerous pieces for print and online media and he also hosts his own blog theo-cracy.com. Gender Equality in the Ancient World? Read more about Gender Equality in the Ancient World? Are We in Tyrannical Times? Has Plato’s Terrible Prediction Come True? Read more about Are We in Tyrannical Times? Has Plato’s Terrible Prediction Come True? The Ancient Greek Symposium: Just an Excuse for Debauchery? Read more about The Ancient Greek Symposium: Just an Excuse for Debauchery?